The asymmetric tread pattern and the sturdy outer shoulder blocks ensure excellent handling characteristics on dry roads, especially at low temperatures. The excellent dry braking performance is given by the rigid block edges. The special refined silica tread compound leads to an optimization of the winter performance due to better micro-interlocking with the road surface. 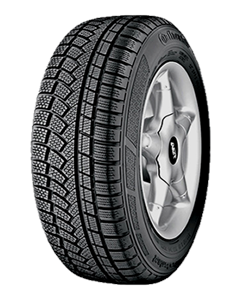 The high sipe density in the centre tread contributes to the optimal grip on snow and ice. The four wide circumferential grooves enable an excellent water drainage and thus provide high aquaplaning safety in the wet and cold winter season. The absorption of stationary waves thanks to rounder ground contact patch (achieved by the AMC-contour -Advanced Mold concept) leads to less deforamtion of the sidewall. A reduced tread deformation can be realized due to more even ground pressure distribution. Continental is the first manufacturer to offer a V-rated winter tyre with unrestricted V-rated suitability (independent of the car weight) for all current and particularly powerful vehicles. This enables safe and fast driving up to a top-speed of 240 km/h (150 mph) (if the weather conditions allow).